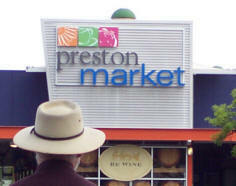 Preston Market is a great place go for breakfast - as long as you like pizza for breakfast. This becomes a bit more understandable when you look at the customers. People from a wide range of cultures - but in particular, Middle Europeans, Turks and Pacific Islanders. And the Islanders aren't used to nouvelle cuisine portions - pizza fills a small gap at breakfast in order to get going. White Hat's current favourite for breakfast is the freshly made Turkish food from the Preston Kebab House stall. Islanders like their meat, and in decent quantities. Follow them to the meat stalls on Saturday morning where they wait for the bargains to appear near butchers' closing time - around noon. A tray will be heaped with a variety of meats. "THIRTY DOLLARS" the butcher will yell at the large crowd at the front of his stall. He will be greeted by a sea of stony faces. 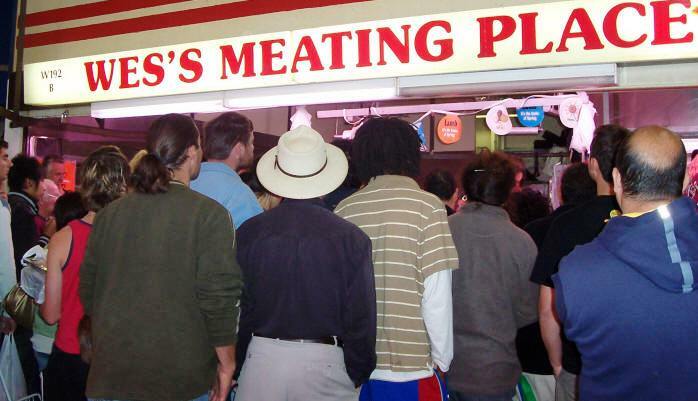 "Come on - thirty dollars - there's nearly forty dollars worth of meat on this tray - who'll give me thirty dollars?" SILENCE. "Alright, twenty-five dollars - who'll give me twenty-five dollars - and I'll throw in this handful of goooormet sausages as well!" SILENCE. "Twenty- three dollars AND these couple of succulent pork chops" A hand goes up. The crowd sighs - a newcomer who doesn't know it's a waiting game and better bargains are to come. "NOW HAVE A LOOK AT THIS! A whole tray of rump steak ... and a dozen snags ... and this leg of lamb. Who'll give me twenty bucks?" SILENCE. The newcomers are learning. Keep your hands firmly pressed in your pockets lest you bid too early. Now, if you are buying for just one or two and don't have a freezer, you can always form a cartel with the Vietnamese mother and gentleman of indeterminate swarthy appearance to bid for the package and split it up your own way. That's part of market shopping, and you can exchange recipes and cooking tips in the process. The Preston Market has a good number of fruit & veg stalls, meat, fish and poultry stalls, as well as Greek, Italian & Middle Eastern Deli's and Vietnamese groceries. There is also a large general wares section for clothing and general goods.